A recent Pew Research Center poll explored correlations between political party identification and beliefs about the origins of species in the U.S. The poll found that self-identified Republicans are the most likely to reject evolutionary accounts of human origins–whether Darwinian or theistic–with 48 percent asserting that humans “existed in their present form since the beginning of time,” a view shared by only 27 percent of Democrats. More interesting still, however, is the Pew Center’s analysis comparing the 2013 poll with the results for the same question asked in 2009. This comparison shows that the number of Republicans who reject evolutionary accounts has increased by 9 points (from 39 percent), and the number of Republicans who accept evolutionary accounts has decreased by 11 points (from 54 percent to 43 percent) over the last four years. 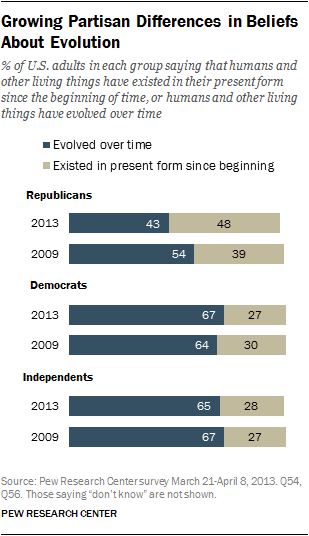 During the same period, acceptance of evolutionary accounts increased by 3 points among Democrats and decreased by 2 points among Independents. Let’s take this data at face value. What changes during the 4 years between 2009 and 2013 that could generate a massive swing among Republicans away from acceptance of evolutionary accounts of human origins–while during the same period we see only drift within other demographics? I would argue that the shift reflects the Republican retrenchment that is taking place during the presidency of Barack Obama. 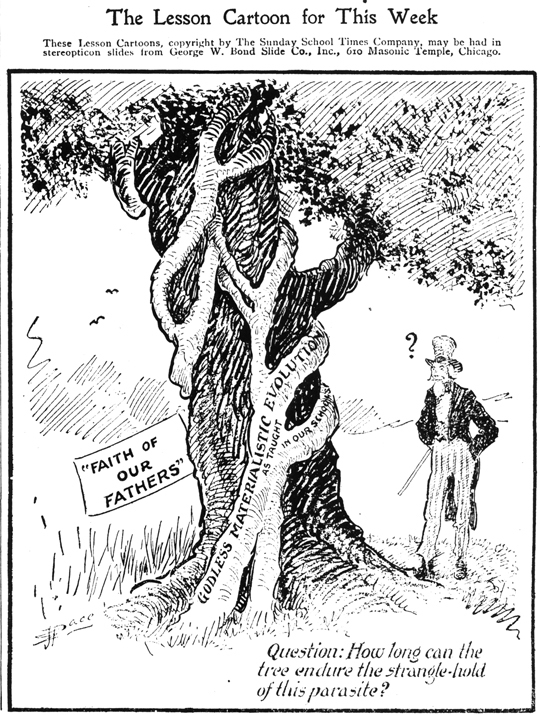 During this period, American conservatives did not simply stand against Obama’s policy proposals: they also underlined their dissatisfaction with the direction of the country’s politics by consolidating certain identity markers that indicated their separateness from what they perceive as the enemy–a liberal, secularist political syndicate. Affirming their opposition to evolutionary accounts (even theistic evolution) is a way of deploying an epistemic regime as an element in an identity program motivated by defiance and rage. This illustrates two features of what I would call postsecularism. First, knowledge and science are not neutral, but are charged with affect, connected to identitarian programs, and easily absorbed into political regimes. Where secularism understands science as an outgrowth of a neutral exercise of rationality, the postsecular lens sees all forms of knowledge and rationality as embedded within fields of power and desire–though this need not be reduced to a simple scientific anti-realism. Second, where the secularization hypothesis proposes that religion will steadily recede from the public sphere, postsecularism predicts a more complex trajectory, in which what gets called religion alternately enters and exits the public sphere in response to different historical circumstances and configurations of power. This entry was posted in Donovan Schaefer, Religion and Society, Religion and Theory, Theory and Method, Uncategorized and tagged Barack Obama, Darwin, Democrats, evolution, Pew Forum, postsecularism, republican party, secularization theory. Bookmark the permalink. Post-secularism is, of course, on firm ground, and obviously so, that the scientific enterprise in embedded in all manner of human networks and dependencies. This truism hardly needs to be trumpeted, and even less so made the banner under which “we” (I, at any rate) march against the likes of the anti-evolutionists. But, to return to my original paragraph, that they can “make” science an object of desire does not really establish much about the post-secularist position. With or without such yahoo racists about, the unmet test of the (strong) post-secularist thesis re embeddedness of knowledge, etc., is whether one can find cases where such embeddedness “makes a difference.” Perhaps I need to be directed to the ‘killer cases’ made by post-structuralists against any notion of scientific neutrality, but there are just too many promises being made about the degree to which embeddedness makes a difference in shaping science — the “natural sciences,” to be precise — and few, if any, persuasive arguments making the post-secularist position. The so-called “human” or “social” sciences are another matter, since they seem to be among the purist demonstrations of ideology going. Yes, I believe embeddedness has lot to do with the choices scientists of all sorts make in entering upon a scientific quest, in deciding which data or interpretation are ‘best,’ and so on. And, this says nothing about ‘grantsmanship’ at both ends of the game. I would not be surprised if embeddedness ruled absolutely there. But, none of this means that evolution does not move closer to true picture of the mechanisms of life. Yes, “true.” Yes, “progress,” as well. I know these claims are not fashionable among us. But, we are indifferent to them at our own peril. Think what life controlled by the yahoo racists who trash evolution would be like. Our response needs an injection of a little more spine. Let’s take pride in thinking! Ivan, thanks for your comment! (I happen to be the author of the post; Matt uploaded it for me for administrative reasons.) I think we’re entirely on the same page: even science that is embedded in regimes of power can be good science that should be supported. I think the project of post-secularism should be complicating the picture of science, rather than rejecting science tout court. This post was designed (perhaps unsuccessfully) to do exactly that by showing how opposition to scientific consensuses such as evolution by natural selection is determined by complex political and identitarian regimes, rather than an assessment of how the world works. As I see it, this is a quintessentially postsecular project not because it attacks science, but because it attacks the presupposition that human beings are first and foremost reasoning beings who produce knowledge independently of systems of power. However, the term “postsecular” is still very much up for grabs so I can see how others using the same vocabulary might be deploying it in different ways. Thanks for there’s words confirming our agreement on basics. The only thing that really I worry about is the use of the word “power.” Why would not the more neutral term “agency” serve the same purpose? The problem with the use of the word “power” is that it is ideologically loaded in favor of discourse that suggests that any order is a order enforced by violence. This is just Nietzsche in another form, namely the one made more recently popular by Michel Foucault. It would seem to me that the use of the word “agency” permits us to avoid commitment to an ideological perspective that is at least highly contestable. Agree? While Nietzsche made us aware of the limitations of the consensus and non-conflict model, the conflict model he presents creates its own problems. At the very least it skews discussion where that is not necessary. So I say, let us use “agency” instead of “power”! Put otherwise , why cannot we just look and see from case to case to what extent conflict is at the core things? and conversely, why, in other cases, perhaps consensus is at the basis of order? I’m for keeping discourse as open as possible. The Nietzschean model simply closes off options in discussion. You’re right that I’m thinking of power in a Foucauldian sense, as something that makes possible rather than merely saying no. I don’t know that this necessarily commits us to a conflict model–I guess I think of it more as a “play” of forces than as a “battle” of forces. Even though conflict would be part of that picture, consensus could be, as well. But I see what you’re saying: how do you address someone in the context of creating political dialogue when you’ve already walled-off the category of agency? I don’t know that I have an answer to that–both models seem to have liabilities.